​Mauro has also tweaked some of the evening pizza ingredients, check them out here. Mauro has decided to continue the popular 2-for-1 Pizzas on Wednesdays, available for all standard-sized, eat-in pizzas. We have a new YouTube video advertising the 2-for-1 pzzas on Wednesdays. ​Take a look at it and let us know what you think! Come and try Mauro's new Special Calzone pizza - if it's popular we'll make it a regular on the Pizza Menu. The earliest pickup time for Takeaway Pizzas is now 4:45pm. Online ordering for our new Evening Pizza Menu is available for takeout orders. Made by NZ company Mobi2go, the Pizza Portal is designed to work perfectly with your phone. Don't know what to do for dinner? Why not order a couple of pizzas for 5:15pm pickup? Watch this space as we add more takeout options. ​Our new Evening Pizza Menu is now active. Available for sitdown or takeaway from Wednesday through Saturday, from 5pm. Our new wood-fired pizza oven had it's first trial today! 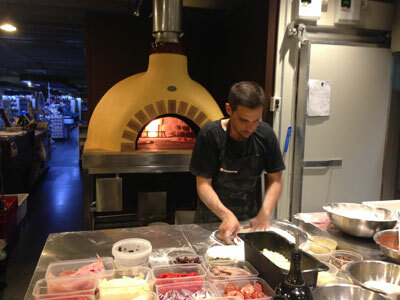 Mauro said that it still need to dry out a little, but the trial pizzas were very well received by staff and friends. He made about 40 pizzas - a mix of large and small and different flavours from the Pizza Menu. Congratulations to Mediterranean Food Warehouse in Wellington. They have refurbished their pizzeria and can now boast the largest wood and gas pizza oven in New Zealand. ​Congratulations also to Authentic Ovens in Tauranga for building such a large (and great looking) oven. Love the colour! Since Stefano left Stefano's Pizzeria above State Cinema things just haven't been the same. But despair not pizza-lovers, Stefano has built a pizza-cart and will be selling his thin-crust pizzas at the MarchFest at Founders Park.